First, I need to tell you what happened so you know what KIND of contest it is. So there we were yesterday, Mom was wrestling Puppy into trying to take a nap, I was showing the best ever example of napping when Mom says "I give up!" and she gets us both ready and says "We're going to Grandma and Grandad's to help plant tulips!" WOHOO! Snoopervisory work! I excel at Snoopervisory work. Puppy got right in, down and dirty with Grandma. And it all got done! I honestly don't know what Grandma and Grandad would have done without us there. Those tulips would never have been planted I'm telling you. They were both very thankful and I got oodles of ear scratches, chin scratches - you know, the good stuff. That's my MOM! I know, you've probably never really seen her before. She's holding Puppy and I'm the one standing next to her. Not the best picture of ME, but that's ok, it's a reasonably good picture of Mom. One of the few she says. Although she also says it shows her jowls. Anyway, here is the CONTEST INFO! Send me a picture of how YOUR human parents, or another family member, look like YOU! Here's an example. Mom says she has jowls in that picture. Well, have I ever got a good set of JOWLS! Or, Mom and Grandma say Puppy has Shar Pei thighs because he has baby fat there and they look a little folded. Or it could just be an expression. I have a picture for this one! Puppy and I. Mine is the first picture. But look at that! We could almost pass as TWINS! Anyway, this is post 591. I'll give you until Saturday November 13 to send me those AWESOME pictures of you and your look alike family! I'm sure I'll be at post 600 by then! Pei-Ess - Oops. Judging will be done by Mom, Dad, Grandma and Grandad, and probably Miss Jenn. In case of a tie, we'll let Puppy decide. So far I only have 1 prize (it's a hippo - because I look like a little hippo sometimes) but I'm sure I can convince Mom to get another one. What else..... kitties are welcome to enter as well, we can find a cat prize. Did I miss anything else? An old picture, but you get the idea. I helped Dad prepare for Hallowe'en. It involved playing in the backyard and getting stuff out of the shed I helped to build ever so long ago. I am such a good snoopervisor. Mom has promised to get me pictures of this year's setup SOON. Other than that, it's was an ok weekend. Lots of napping. There was NOSEVENTURES this morning though! I had to take Mom, Dad and Puppy to the voting station. Our municipal elections are today. We all voted and then Mom, Puppy and I walked home. Dad had to go back to work, but I was SO happy to see him. I miss him when he's at work. It was a GREAT walk home because we never walk along those paths so it was all NEW smells. Oh my dog it was FABULOUS! Until it started to rain. Then I got wet and that's not nearly as much fun. I made it home without shrinking away to nothing. Thank dog! After I finish my blog, I think I'm going to go and Nap. Grandma and Grandad took Puppy out so I'm here with Mom. I figure I can look cute and comfy and she'll join me for a nap/cuddle! We did a lot this weekend but first I want to start off by making a negative comment. Mom says to get the negative stuff out first so you can enjoy the positive stuff more. Someone commented on my blog annonymously and said something rude. Mom will type it, leaving out the rude part (which is anatomically impossible because I'm neutered). It's just a BLEEPING dog, get over it. Uh hunh. Yeah, well, sorry Anonymous, but I sound much happier than you do, possibly because I am a Dog That Blogs. Mom sounds happier than you and Puppy kept her up half the night. So, another thing Mom says, if you can't say something nice, don't say anything at all. Lets move on! We had a HUGE influx of people at our house on Friday. It was to celebrate Puppy's First Birthday. Grandma and Grandad were there, Grammy and Bionic Grandpa, my Great Granny was there too! So were my human cousins who Mom nicknamed Chaos, Panic and Disorder, and their Puppy Mayhem was there too. Grandad was official photographer. 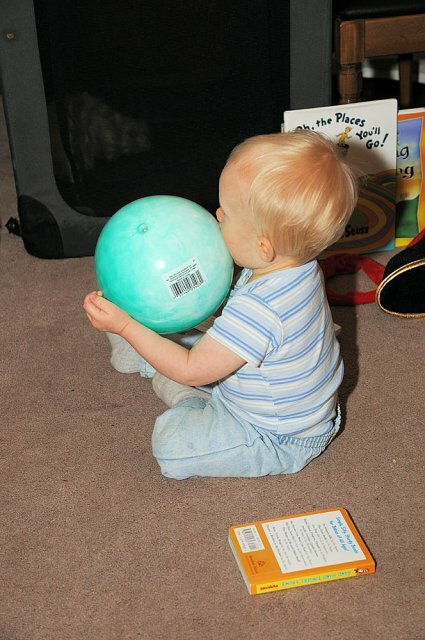 We finally have a picture of Puppy playing with the ball I got him for his Birthday! Photo by Grandad. You can see Mayhem in the background using MY portable kennel. Humph. Anyway, Grandad thankfully remembered that it was my house too and took a picture of me. Near the food table. Everyone said Mom put on quite a spread. I didn't get much of it. I did manage to snag a piece of chocolate cake Puppy threw on the floor. Mom said one tiny piece the size of her thumbnail was ok, but NO MORE. There I am. Don't I look starved? I though maybe someone would at least give me a carrot or something. NOOOOOO. I did snag a sausage roll or too that Puppy dropped on the floor. Oh, Puppy also got a book called Walter the Farting Dog. We haven't read it yet, but it sounds interesting. Saturday was pretty boring, with nothing exciting happening, Sunday was great though! I went Noseventureing to my Grteat Granny's! I had to patrol her backyard. Just in case you know. I also had to sniff around her house and mark territory in the kitchen and dining room (Dad was NOT impressed - I think he might be jealous I can pee on the floor and he can't). Mayhem had been there and she peed first. That's my story and I'm sticking too it. Today started off pretty good too. A nice walk with Mom, some food dropped from Puppy's chair, and now a Monday Morning Report Blog! WITH PICTURES! Look at that! It's Monday Morning, there's a report AND a picture. It's been a nice quiet weekend here. I've spent a lot of time in the backyard. It's been nice and sunny and not too cold. In other words, practically perfect! To make it even better, I snuggled and napped with Mom. Not so much with Dad, mostly Mom. That's ok. Today is Thanksgiving here in Canada, which means it's a holiday Monday! Dad is at home today! I'll have plenty of time to snuggle with him. Happy Thanksgiving and Sniff ya later! Photo Friday - Puppy Edition! I thought I'd be a good Big Brofur and dedicate this post to my Puppy. He turned 1 year old yesterday. He still can't walk by himself, he's not eating as much solid kibble as I am but he is feeding me these wonderfully tastey little things. Mom says they're O's to cheer us up. Ok, yeah. Whatever. A Big Hap-PEI Birthday to my little Brofur, Puppy. I present to you the latest smiling Pei picture. You have to smile when your Brofur turns 1 you know. For those that are interested, I got him a Ball. I don't play with them, but apparently he likes them. Mom doesn't have pictures of that yet. Soon I hope, I want to share them with you! Yesterday was Mom's Barkday. I gave her the BEST PRESENT EVER! Bolo cuddles! So, our family tradition is that on your birthday you get to pick what you want to do. Mom wanted to do two things, she wanted to either go to the petting zoo, or take a walk with me. She chose to talk a walk with ME because I wasn't allowed at the zoo. Is that love or what? Here I am in mid-shake. Mom didn't get as many nice pictures as she wanted, but hey, it was a Noseventure with the camera and there are a few nice shots. 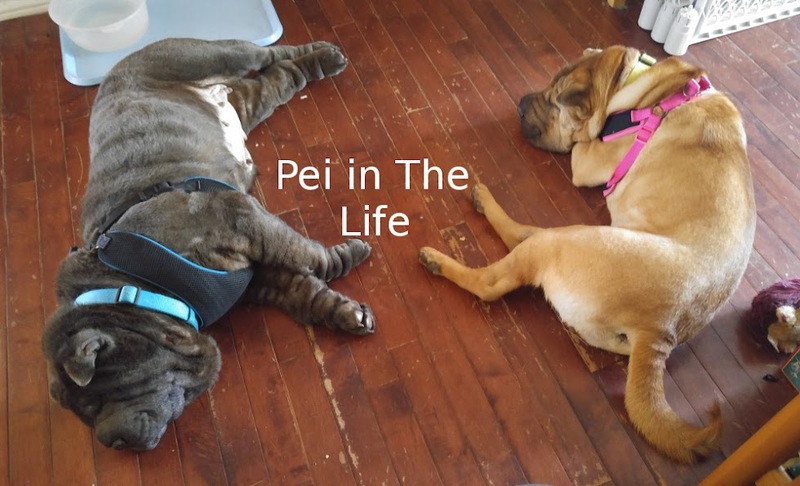 Let me tell you that after a walk in all that stuff, I was EXHAUSTI-PEI-TED. Yeah...... uhm....I didn't lose my head. Although I did settle on Puppy's Parrot. The Parrot is named Parrot-Ducks, by the way. See! There's my head. A little blurry, but there it is, still attached. When we got home I had to cuddle Mom some more. She said she had a great birthday and it was all MY FAULT! Pei laughter. Mom found some old pictures of me! That's me and my cousin Khaya way back in the Spring/Summer of 2006. Aren't we cute?